Order Now Take a Peek Inside! Your Simple Home Handbook is for all the people who are tired of too much stuff. It’s for those who want to cut the clutter and actually use and enjoy what they own. It’s for people who want to craft a beautiful, inviting home without spending a penny. This book is for people who recognize that “more” doesn’t always mean “better” and who are willing to be a little counter-cultural for the sake of breathing space in their home. 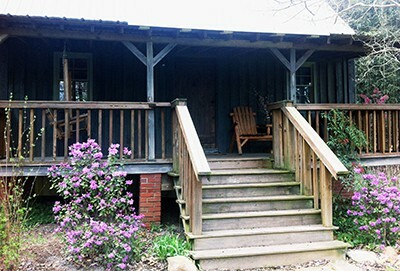 Do you long for your home to be a place that breathes welcome; that centers on relationships and not on possessions? Simplifying will transform your home into a more pleasant place to be. You will have less to maintain and clean, less to move when the time comes…and more room for hospitality, even in small spaces! If you are just beginning your journey to a simpler home, you’ll find that Your Simple Home Handbook follows a small-steps approach that’s non-overwhelming but will motivate you toward change. For those of you already passionate about simple living, this book is packed with resources and inspiration to help you take the next steps towards the home you want. 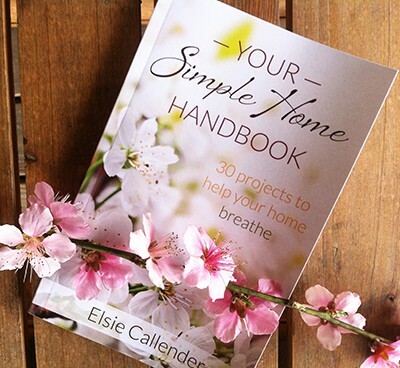 I'm Elsie Callender, and I've been fascinated by the idea of simple living since I was a little girl. Although I loved the idea of simple living, it wasn’t until a few years ago that my husband and I really buckled down and began the process of truly allowing our home the space to breathe. Truth be told, we didn’t have many other options, because we were preparing to move into a 600 square-foot cabin - with no closets! As you can see, it was crucial that we decluttered our space and find a method for simplifying our home. And that’s exactly what my husband and I did! We examined every single item we owned with a critical eye and asked some key questions to decide if we valued the item enough to have it in our new home. 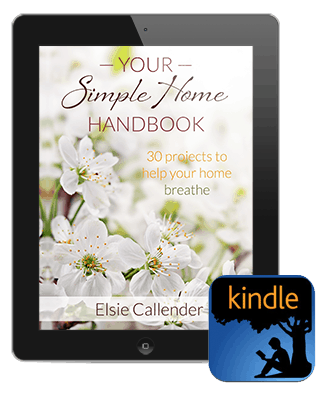 Your Simple Home Handbook is a step-by-step guide to lead you through my method of decluttering and loving your home. The path to simplifying is a beautiful journey that actually becomes a lifestyle - a journey that never really ends. And every single step is so worth it. Today, I can tell you that living in an uncluttered home is so freeing! We have less to clean and put away around the house. Any clutter that finds its way into our lives is no reason to despair or feel guilty, because we now have a system for eliminating that clutter and keeping it at bay. If I had known how much simplifying would enrich our lives, I would have gone full speed ahead much earlier! Won’t you come along and join me on the beautiful journey to a simple, breathable home? I found this book to be easy to read, well-said, motivating and helpful. In fact, I've already done a few of the projects listed. But more than that, I'm understanding the value of a simple home more than ever. Thanks Elsie for this great resource! I loved this step-by-step guide to simplifying your home! If you struggle with too much stuff, but feel powerless to know where to start or how to cut down on clutter, this book will give you the practical tools and inspiration you need! This isn’t your ordinary de-clutter book! It’s a handbook that walks you through a simple step-by-step process to de-clutter and organize 30 spaces in your home. I love the questions she asks to help guide your decision on what to keep and what to get rid of. They aren’t your typical ‘Have I used this in the past year?’ questions. They are meaningful and insightful and really help you decide what’s worth keeping. Callender even provides a section on what to do with all the items you are discarding (with tips on how to sell them through an online site). I love this handbook, and I can’t wait to start checking off the spaces on the checklist at the end of the book! This is an exceptional read for anyone looking to live a simplified lifestyle. If you feel overwhelmed by clutter, but don't know where to begin, this is a great place to start. 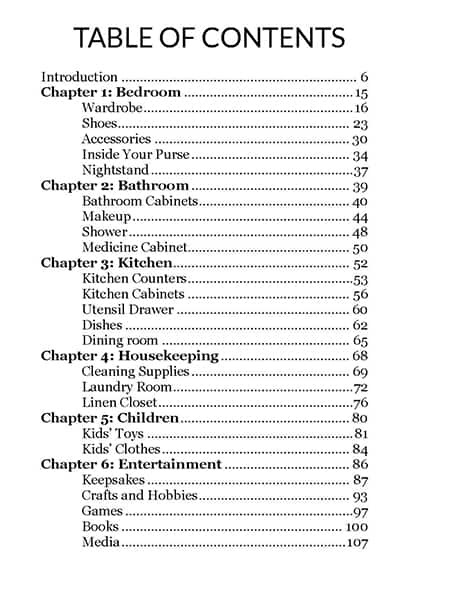 I love how the author breaks down each area of your home and gives you a step-by-step guide on how to de-clutter. Then she takes it a step further and gives you practical tips and advice to keep it neat and tidy (and more beautiful!). 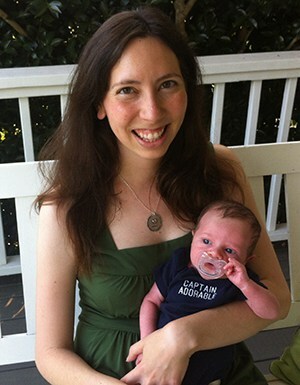 I am such a fan of simple living, and I wish I had a resource like this years ago. 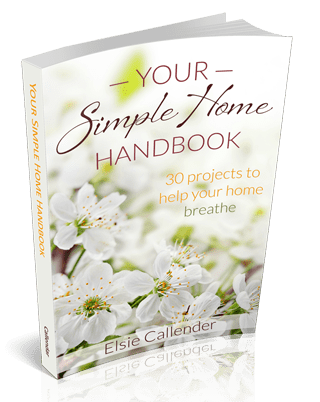 Your Simple Home Handbook truly is a step-by-step guide to lead you through Elsie's method of decluttering and loving your home. You'll cover every area in your home and be left with a more organized, peaceful and welcoming home. Take a look at the Table of Contents below to see exactly what is covered in the book! Tell Your Friends about Your Simple Home Handbook! 1. Is this book print or digital? You can get it in either format. The print edition is available HERE. You can buy it in a digital, instant-download format using the "Buy Now" buttons (above) for the PDF or Kindle editions. 2. 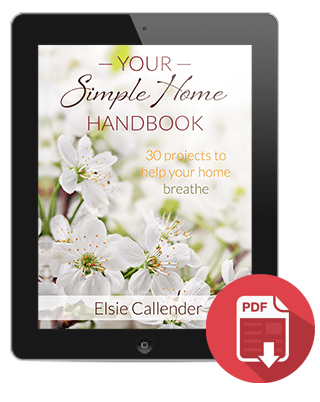 What happens after I purchase the eBook version of Your Simple Home Handbook? The eBook is an instant downloadable PDF edition, so you will not receive anything via land mail. Instead, check your email for a link to download the book and save it to your computer. If you do not see the email, you may need to check your spam folder. 3. How do I read an eBook? You can read an eBook on your computer screen, or you can print it off and put it in binder or get it bound at an office supply store. I suggest printing it at an office supply store if you are going to do that. If you have an electronic device like a Kindle or iPhone, you can also email the PDF eBook to your device. 4. How can I read a PDF eBook on my Kindle? 5. How does Your Simple Home Handbook compare to The Life-Changing Magic of Tidying Up, by Marie Kondo? I loved The Life-Changing Magic of Tidying Up, but it leaves readers wanting something more. 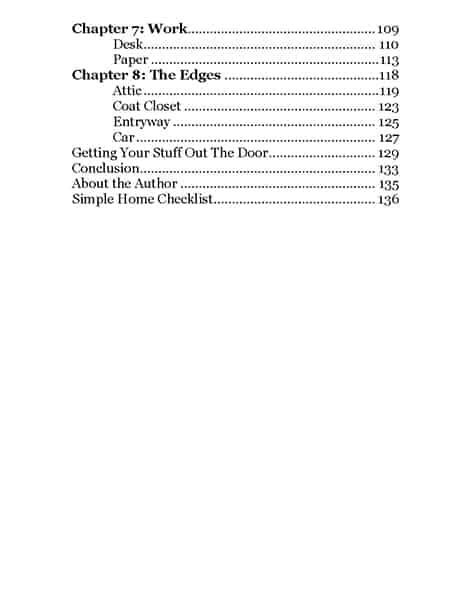 While Kondo's book is a good inspirational overview of a whole-home purge, Your Simple Home Handbook goes deeper. My book gives you a room-by-room process for decluttering, with concrete details that are more applicable to homemakers in the Western world. You can email me at [email protected] I will try to get back to you in a timely fashion! 7. Do you have an affiliate program for the book? Yes. If you are a blogger and want to promote the eBook, you can sign up as an affiliate here. If you want to promote the Kindle or paperback editions, you can do so using your own Amazon affiliate links.